The attempted assassination of Representative Gabrielle Giffords raises the bar for political lies and hate to a new level. Previously, incendiary political lies stopped just short violent imagery. 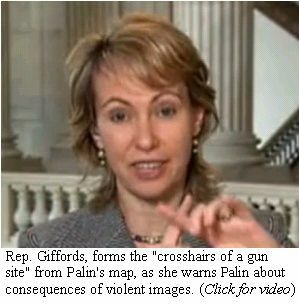 Sarah Palin's Take Back 20 campaign presented a violent threat in the form of rifle site crosshairs placed over the congressional districts of 20 Democratic supporters of health care reform.